Thank you for choosing the UF Student Health Care Center. With the exception of urgent illness/injury care during regular business hours, CALL FIRST to be seen: (352) 392-1161. Save time in the waiting room – fill these out ahead of time! TRANSPORTATION: Parking is available but limited. If you are able, taking a bus or shuttle, biking or walking is the best way to reach us. RTS BUS ROUTES: Routes 34 and 38 will bring you closest to the SHCC/Infirmary Building at 280 Fletcher Drive. GATOR LIFT: Provides on campus transportation to members of the UF community with permanent and temporary disabilities. AFTER-HOURS: Click here for more info, including local urgent care centers. Call the main number (352-392-1161) or your team or specialty clinic directly, or request your appointment online via MyUFHealth/MyChart. Call your team or specialty clinic directly to avoid a no-show charge. You may incur a no-show charge of $25 if you do not arrive on time, are 15 minutes late or do not cancel. The UF health fee, a per-credit hour service fee included with tuition, helps cover most office visits at the Student Health Care Center; however, this fee does not cover all possible service charges at the SHCC, including but not limited to physicals, procedures, lab tests, X-rays, medications and medical equipment. Click here to learn more. We recommend reviewing all insurance benefits and exclusions before your first visit. Contact your insurance company and provide them our tax identification name and number (Florida Clinical Practice Association, 591680273) to learn how your policy will work at our facility. The SHCC will bill your insurance company for you if you provide all policy information. You are financially responsible for service charges that are not covered by your policy. Click here to learn more. All medical and psychiatric physicians at SHCC hold faculty positions in the College of Medicine and, therefore, may have academic and/or clinical teaching responsibilities with medical and physician assistant students. Most of the teaching assignments bring the faculty member into direct contact and academic involvement with only a few students in each class year. Because of the potential for conflict, medical and physician assistant students presenting for services at the SHCC or the SHCC@Shands satellite clinic will be given the option to see: a faculty member who has not, and will not, have an academic role with them; or a healthcare provider in the community. Costs may be reimbursed by any health insurance the student carries or may require an out-of-pocket expense. 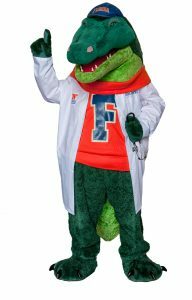 NOTE: At the beginning of the semester, students enrolled in the UF insurance plan have only this option; however, a referral may be requested for preferred community based providers to assist in claims coverage.